Yes I agree with Douglas, the show was sublime. No more said. 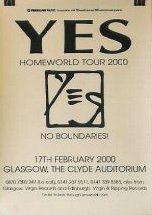 I have to say this concert was a little bit of a disappointment after my previous experience of Yes, which was one of the ''Union'' shows at Wembley, which at the age of 19 was pretty tremendous. The Glasgow show for anyone more than 10 rows back was woefully under amplified, more like a cocktail bar set up than a rock concert and to be honest this really put the mockers on the whole thing for me. I have tickets for the Symphonic Tours'' visit to Glasgow, which I ordered on the internet and have managed to get seats 3 rows from the front and so do not anticipate having the same problem! "Theirs Is Truly No Disgrace"
quote.......By all the usual benchmarks, Yes should have shuffled off this mortal coil long ago. Jon Anderson's stalwart troupe of musicians no longer shift albums by the platinum bucketload. Nor do they inspire a new generation of prog rockers, keen to replicate the epics such as TfTo or KtA. But when it comes to playing their distinctive brand of harmony based rock fused with jazz and innovative musicianship, nobody does it better. Last Thursday the faithful who have followed the band in all its myriad forms came to worship at the altar of Yes at the Clyde Auditorium. And not one of us was disappointed. This is a band that has quite simply improved with age. Founding members Chris Squire, Steve Howe, Alan White and of course the pivotal Anderson alongside Billy Sherwood and keyboards maestro Igor Khoroshev, they took us on a magical history tour. Opening with Yours Is No Disgrace, they then ripped into And You and I, Time and A Word, Awaken and a supreme rendition of I've seen all good people. But it was great to hear the new songs from the bands excellent 30th anniversary album, The Ladder, sounding so good beside the classics. Homeworld and It Will be a Good Day sounded like a band in the first flush of youth rather than one which could soon bow out of the concert spotlight. Indeed, how many bands today can boast a five minute standing ovation for every song?. They rounded off the night with Owner of a Lonely heart - not a song typical of Yes. But the thunderous applause which greated Roundabout proved that, despite what Neil Young says, it really is better to burn out. However, the Yes candle still has plenty of life flickering in it yet.....unquote. 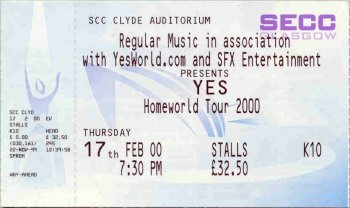 We were in prime seats to get right into the atmosphere of the show - 2nd row centre isle,right in front of Chris Squire. Prior to the show I was a bit concerned about the sound quality being this close up and given Jon's very 'quiet'sounding vocals from the '98 OYE tour row 4 centre. Not to worry - much better this time from where we were seated. The band this time around seemed much more together as a unit compared to OYE tour (see also Bob MacInnes' review of RAH 19/2/00). Jon especially was giving it everything,standing right at the front of the stage on numerous occasions and dancing around quite a bit. Much more the 2 years ago. Reminded me of his enthusiasm on the ABWH concert video. Numerous highlights with Awaken a stand out. Billy's overall backing vocals were great and his performance during Hearts was just brilliant. The Ladder material was played superbly and fits nicely with the older stuff. IWbaGD is a great track and once again the backing vocals were exceptional on this one. For those in the audience who could not see, there were some great Scottish jigs being danced (sorry, attempted! )in front of the stage by a 'not-to-be-denied' YesChick and various surprised male volunteers from around the first few rows. This was much to Chris and Billy's amusement - and ours. Great moments too at the end of the show and being able to approach the stage and shake hands with the band as they waved to the ecstatic audience. We all made way for Alan White's mum and eventually when Jon managed to get Alan to come back onto the stage they had a wee kiss and cuddle to great roars from the crowd. Nice to see Brian, Stephen,Scott and Iain. Magic moments and a magic night. Pick up the wives and onward to London. 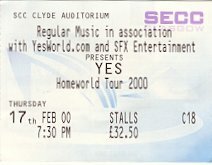 I had the great pleasure of seeing Yes for the second time this tour, at my home town of Glasgow, Scotland 17/02.2000. All I can say, is that they were absolutely sublime. They really were very, very good indeed. I took my long suffering wife Shirley, who over the years has become accustomed to Yes music, BTW she loves _The Ladder_, but she does has difficulty with some "classic" Yes tracks. She absolutely loved it also. She said to me "Is that it already", when they finished. 2 hours had passed in what seemed minutes. Jon was spot on all night, Igor was "Igor" :o), Steve was absolutely superb and I can't find superlatives for his performance, Chris was as you'd expect (the new father's swagger and demeanour were as you'd expect for a 50+ who still has lead in his pencil), Alan hit the "ride" too much for my liking (thanks for spoiling it to all who pointed this out to me) but was otherwise superb, and BS was absolutely superb, and I say this knowing all of the flak he has received recently onlist, but I payed special attention to him all night. After the show was over, I got to thinking, "will I ever see them again?" They are getting on in years, although the performance that night would not in any way suggest they are finished, I just got the feeling that I had witnessed the end of an era. I'm not normally a pessimistic guy, but as they played "Awaken" (my favourite all time track), and my eyes filled up with tears, I just thought to myself "will I ever see and hear this again live"
My first ever concert was Yes in 1977, and they played "Awaken", but alcohol and hashish meant that I have no memory at all of the second half it was so good, so I paid particular attention this time, and they really did play it so well. So well. Honestly, (those of you who have seen them this tour know what I'm talking about), when Chris hit the bass pedals, the whole venue shook. Awesome. The second half and ending were SOOOOOOOOOOOOOOO powerful. As I said, I was completely overcome with emotion, and I just stood there................. in awe, tears running from my eyes and down my cheeks (unbeknown to my wife). Absolutely wonderful. Will I have the chance to see and feel this way again however? I do hope so. Live, they have improved so much from the OYE tour, and I'm just so pleased I managed to see them in the twilight of their career, because let's face it, they can't go on forever. I wish they could, but I know they can't. They really were that good. I'm still coming down, and this time no drugs or alcohol were involved. They are definately getting better with age. Immortality is theirs in my mind. 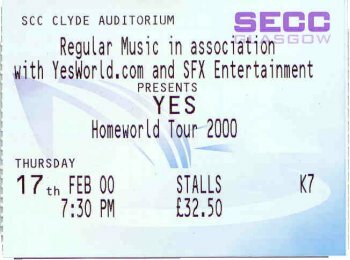 My wife and I saw Yes last night at the "Armadillo" in Glasgow. The mix of songs was excellent, from the second album through to the latest. The atmosphere was excellent, and this must have rubbed off as EVERY one in the band played and sang there hearts out. I can honestly say it's the best I have seen them by far. This includes Greens Playhouse, Apollo and Kelvin Hall (all past Glasgow venues) gigs. I must also applaud the staff of the venue, my wife and I had a problem with our view (Dexion Frame for sound desk). We were moved to BETTER seats by staff even though it was a sell-out. The sound was excellent, and I also over heard the sound technician informing someone that it was an excellent gig. (THE BEST YET)?????? Another stunning performace by Yes. Just over 2 years since their last visit to the Armadillo, and how different the set list was - The Ladder very well represented (compared to OYE the last time - says it all !! ), in a very well balanced set. The new songs were very well played - all my favourite tracks from the album were there, although I'd love to have heard 9 voices. Homeworld in particular was outstanding - a mini Yes classic, in my opinion. I think the new material sits quite happily alongside the likes of Perpetual Change, AYAI, even the magical Awaken. My only minor gripe was the sound - Yours is no Disgrace opened up with a rather bass-heavy, muddy sound, and the keys were more imagined than heard. The mix improved quickly, but the overall volume seemed low, and never really 'filled' the venue like the last time round. I was in about the same place as the last time, so I don' think that was a factor. Jon was very chatty between songs, including "tonight the Armadillo is the house of Yes", but the combination of the lowish volume and some arseholes shouting their heads off meant I didn't really hear much of what he said. I had spotted the little harp early on, and when it re-appeared, almost ceremonially, at the end of Hearts, I knew I was in for a treat. And what a treat - Awaken was truly majestic. Igors keys were superb, and he really got the 'big' organ sounds right, and his playing was brilliant. Chris too, with the triple-necked bass. It looks really awkward to play the fretless at the bottom, but he plays it well, and manages to sing at the same time !!. The Hearts/Awaken section was a highlight, and there was a huge long standing ovation at the end of Awaken. 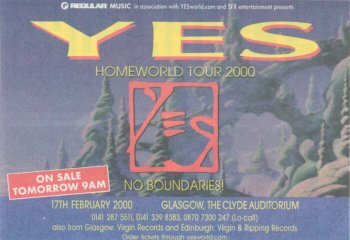 I really enjoyed the Yes Album songs too - YIND was spoiled to some extent by the poor mix, but by the time Perpetual Change came rouns that was sorted and they really ripped into it - Steve and Chris in particular. Overall an excellent show, THE highlight was Awaken with AYAI, Homeworld, Perpetual Change and Hearts also standing out, but everything was so good it's hard to pick anything in particular. I fervently hope this lineup keeps going in the direction they are, and hope to see them again, with more new material in the future. 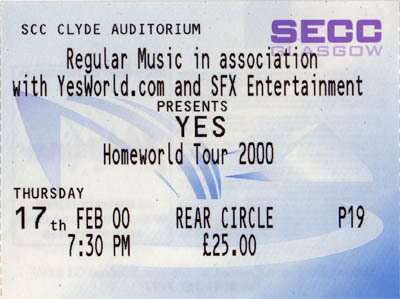 And finally - on to the last leg of my Yestour 2000 - Glasgow on a wet Thursday night. My seat was about ten rows back, almost directly in line with Billy, so for the first time I was able to fully appreciate how much he brings to the bands performance. Billy's contribution is not just in terms of the obvious songs that he leads on, but also on the classic numbers where he works real hard to enable a full sound to be delivered, enabling Steve to concentrate on those all-important lead runs. Without Billy these performances would not be as dynamic as they are. Billy has received a great reception at all three shows I have been lucky to attend and this is richly deserved. He regularly received an ovation after his solo in Hearts - which has been outstanding every night. Steve was masterful all night I cannot recall a note out of place - we were even treated to his famous spring chicken routine for the first time on my tour. Steve's playing is never less than inventive - always challenging the audience - will he go this way or that, but always retaining the link to the theme. Homeworld is now beginning to fly with Steve adding a number of flourishes to the album version. Steve's work on Perpetual Change is also worthy of mention - the last three minutes of this is a great jam session led by Steve - if only this would go on for longer. Alan and Chris where again inventive, and as at Liverpool on Monday have added to the bass and percussion effects in most songs. Tonight's most obvious re-working was Hearts - Alan was wonderful here and at times I just shook my head in disbelief that he had thought to add this or that extra beat into the number - Alan you are an exceptional percussionist - thank you. Chris clearly loves playing in Scotland and struck up a great rapport with a particular group near the front. Jon was note and memory perfect tonight. He seemed very relaxed, confident, happy and genuinely moved by the reception given by Glasgow to the band. Igor is a genius - enough said. At Manchester I noted that I thought that in my opinion he was close to being the finest keys player Yes had ever had. I am now certain that he is - in my opinion he quickly adds. The set list was the standard one - with Clap played as a first encore. Particularly outstanding were Awaken, Hearts, Face to Face - a great effort this one, how about this as an encore to replace Owner should we be fortunate to witness another tour. Lightning Strikes also came across very well tonight - best version I have seen. Quoting these few examples is unfair - the whole show was exceptional. As a departure from the norm, Jon dedicated Nous Sommes Du Soleil to Alan's Mum - May - who was in the audience and received a nice round of applause. And finally sad to say the show ended with a security alert. Just as the band were leaving after the final bow, someone rushed the stage causing alarm. Jon quickly intervened and then escorted Alan back onto the stage to embrace and kiss his Mum - a nice ending to a wonderful three concerts. Thank you guys - hopefully see you again soon.